For over a decade Lummi Elder and House of Tears Carver Jewell James has been creating totem poles and taking journeys to deliver them, which have allowed people to meet together over those totem poles and heal. Please come to the Blessing Ceremony tomorrow, August 22, 5:30 p.m. at 2665 Kwina Rd Bellingham for much healing is still required! Below is part of the public comment of Jessie Ignacio at the Tongue River Railroad Draft EIS Public Meeting on June 11, in Lame Deer, MT, which is the tribal and government agency headquarters of the Northern Cheyenne Indian Reservation. Jewell James, is delivering this year’s totem pole as a gift to the Northern Cheyenne people at Otter Creek, the site of a proposed mine that would feed the proposed Tongue River Railroad. “JESSIE IGNACIO: … We could go back and on and on about this traumatic time in history that everyone seems to have forgotten about places like Sheridan, Miles City, Forsyth. Who do you think those towns are named after? Sheridan massacred and tried to annihilate the Navajos and worked his way up here. Miles City fought at the Little — well, Miles, General Miles fought, supposedly, at the Little Bighorn Battle and lost. Forsyth was charged with the entire Sand Creek massacre and was only given 14 years, to have this later acquitted and exonerated. You think we like living here as it was? Look at us still surviving here as it is. The government spits in our face and they — these are men who tried to kill the Indian, save the man. There was an order out for a kill all order on every single Native American. And if we can survive that, I think we’ll be better off without this, when before we didn’t have a voice. We didn’t even know English. We didn’t even know how to write. We might not have come that far, but with the education that you’ve given us, we might even be able to beat you at your own game, with education like you provided us here today. That’s what I want to look forward to. Yes, we have a religion, and it’s a spiritual one, connected to this earth. Why do you think we fight so hard for what we believe in? Because it’s all around us. We have ceremonies the way an average person would go to church. We pray to the same God that created all of us here. And to take everything that we’ve ever known away from us and leave us with this cod liver oil with 14 percent alcohol in it that Sioux Indians and Cheyennes would drink themselves off of because you took away our entire rights as a human being. Last I checked, God was the only one allowed to judge any man and deem them to be dead or alive. But here in Sand Creek, you have solders parading around with human body parts and genitalia, whole bodies as a badge of honor. And at the Fort Robinson, you have children’s and infants’ skulls used for bullet pouches, infants used for target practice. University. I hope that others can follow in her footsteps, because I had a person tell me they’re not going to listen to you unless you have a degree. But I stand here as evidence. I don’t even have a high school diploma. And how many people besides me? But what I do have is knowledge, and I will continue to learn more about this. And what I have learned is actual facts on the coal companies. Coal, from 2003 to 2012, it’s negative 12.7 percent. And that’s supposed to be change. In 2013, it was 4.8 percent. And a thousand megawatt hours it takes to generate is at 1,514,043, for a total percent of 37.4. When you have wind, that’s at a thriving 19.1 percent and only takes a hundred and forty thousand eight hundred and twenty-two thousand megawatts an hour to generate. Solar in 2013 was at 141 percent, compared to what it was at 2004, at 200 percent. It may have declined, but it’s still in the hundred percents, whereas 2013 for coal was at 4.8. That’s the future. And there’s a man named Henry Red Cloud teaching the Sioux Native Americans solar paneling, and they’re thriving if we can take away what these corporations are doing to us. We’re just giving them money that we’re not seeing, living off them as it is. Why would we want to live off the government after what they’ve done to us? Sign here, we’ll give you education, healthcare. 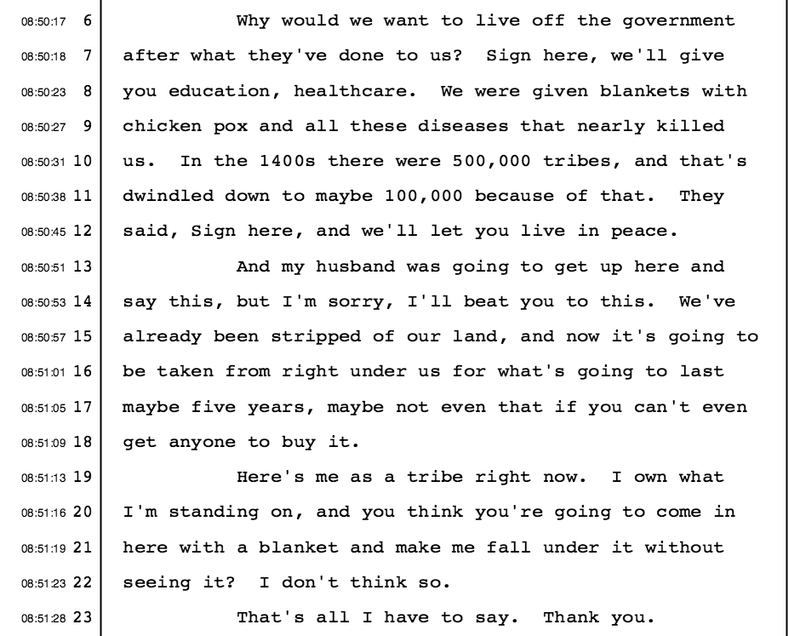 We were given blankets with chicken pox and all these diseases that nearly killed us. In the 1400s there were 500,000 tribes, and that’s dwindled down to maybe 100,000 because of that. They said, Sign here, and we’ll let you live in peace. say this, but I’m sorry, I’ll beat you to this. We’ve already been stripped of our land, and now it’s going to be taken from right under us for what’s going to last maybe five years, maybe not even that if you can’t even get anyone to buy it. seeing it? I don’t think so. Read Dena’s post on the Coal Stop Facebook page here. This entry was posted in Action, Announcement, Commentary, Facebook Post, Information and tagged 2015 Totem Pole Journey, Coal, Gateway Pacific Terminal, GPT, Henry Red Cloud, Jessie Ignacio, Lame Deer MT, Lummi Nation, Northern Cheyenne Nation, Otter Creek Mine, Tongue River Railroad, Treaty rights. Bookmark the permalink.